Have you ever thought of or heard your friend asking 'where to sell my iTunes gift card?' and you were like what is he talking? Well, perhaps, you may not have known the answer to the question at that time. But with today's post you'll get to know about whether you can sell iTunes gift card for cash or not. Moreover, we have also offered 2 bonus tips for you to deal with iTunes issues or day to day iTunes tasks. Well! The iTunes GiftCard can be redeemed to cash if you can find the right buyer in person or online. Sites like Cardpool, Giftcards.com, CardKangaroo, and CardCash etc. allow people to sell their unwanted iTunes gift cards. Though, one must pay close attention while picking a legitimate website to sell iTunes gift cards. iTunes gift cards are one of the widely resold gift cards that fetch almost 65% of their value, i.e. for a 0 card. You can receive payment through PayPal, electronic deposit or cheque depending on your convenience. Since, you couldn't sell iTunes gift card for cash to anyone and now trying to redeem your iTunes gift card via iTunes application. But, your iTunes pops up unknown errors or bugs and stops buzzing to move ahead. Then there is only one solution that can get rid of the problematic iTunes, i.e. Tenorshare TunesCare. It resolves most iTunes errors and fixes iTunes sync problems as well. Whether iTunes can't connect to your iOS device, read content from iPhone, or the sync session turns futile. You can always look up to Tenorshare TunesCare. Moreover, it improves iTunes performance and repairs iTunes playing issues, install and update errors, and fixing the corrupted iTunes library. Step 1: After installing and launching TunesCare on your computer, connect your iPhone using a lightning cable. Tap on 'Fix All iTunes Issues' tab from TunesCare interface, in case you are experiencing issues with your iTunes application. 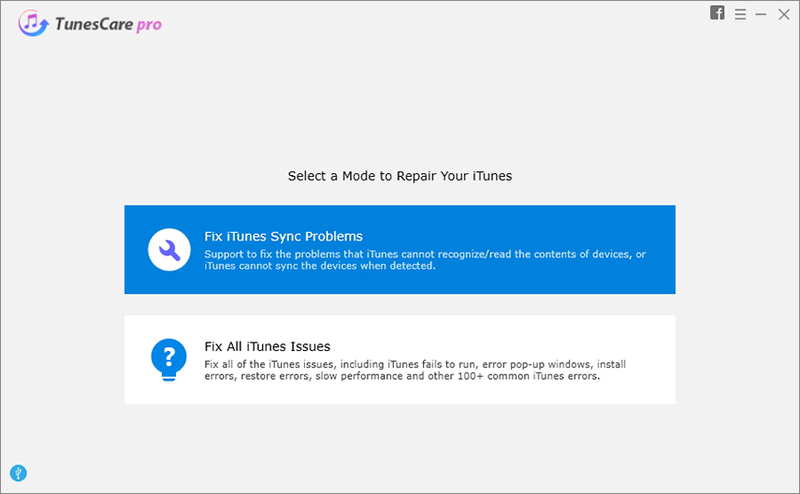 Note: You can hit on 'Fix iTunes Sync Problems' button in case you are experiencing issues regarding Sync errors or the iTunes library is corrupted. Step 2: Lastly, hit on 'Repair iTunes' button. Within a fraction of minutes your iTunes will get repaired. You can relaunch iTunes to get done with the operation you want to perform on iTunes. Well! That was all that you need to know if you're failing to redeem iTunes gift card for cash. This section is a bonus tip for the iOS users to get rid of all the day to day iTunes issues. Opt for Tenorshare iCareFone and you can selectively restore and backup your iOS device faster compared to other tools. Moreover, it enables you swiftly manage your iPhone without causing any data loss. iOS device and iTunes performance gets enhanced with this application. It takes care of most iOS issues and transfers a range of files including media, contacts, SMS between your PC and iPhone sans restrictions. Launch Tenorshare iCareFone on your system after installing it. Take a lightning cable and then trust the computer by tapping 'Trust This Computer'. Press 'Backup & Restore' tab afterwards. Pick your desired file types by ticking them or select all by marking 'Select All'. Hit the 'Backup' button soon after. You can see 'Backup Completed' message on screen, along with the list of backed up data. Choose 'View Backup List'/'View Backup Data' option to view the backup. Launch iCareFone and with a USB cable, connect a new iPhone to your PC. Hit on the 'Backup & Restore' tab and then choose 'To view or restore previous backup files' from the bottom-left part of the window. You can find a list of iTunes or iCareFone backup files. Pick a backup from there and press 'View' to initiate scanning of the backup file. Results will be loaded on the next page. Preview and select what you wish to restore from the next page. Then tap on the 'Restore to Device' or 'Export to computer' option from there. Tap 'Restore to Device' so that the data gets restored to the new iPhone. While speaking about various issues related to iTunes and selling iTunes gift cards. There is no other software that can manage your iOS device so efficiently and fix major iTunes issues. It is a must have software, if you are a regular iTunes user to sync, transfer or manage iOS devices through computer.